At an early age I experienced my parents’ sacrificial hard work and how my future would look without a proper education. “Tu eres el hombre de la familia,”(you are the man of the family) is what he would tell me, in addition to “Tu tienes que ser mucho mas que yo” (you have to be much more than me). The best experiences of my father occurred when he was under the influence of alcohol and would embrace me saying “te quiero mucho hijo.” It wasn’t easy for him to say those words when he was sober though. Dennis Sanchez with his father. As great of a man as is my father, he was also the cause of many hardships that my family went through, and I discovered later in life is what most Latino families experience with los hombres machistas. Radical pride and excessive ego were the main characteristics of my father, during my juvenile years, resulting in the outbursts of anger and resentment when challenged. To challenge him was to sin and the penalties were traditional disciplinary actions and/or the loss of privileges and support. Reasoning was not possible because, in his mind, he could never be wrong (I was too young and inferior to challenge his beliefs and my mother’s suggestions and opinions didn’t matter because he was the man and it is only his place to make decisions for the family). In addition, his narrow viewpoints would blind him from manipulative tactics that were used by others, como las tias, since all they needed to do was twist situational perspectives so they challenge his ego. “¿Siendo el hombre, no puedes controlar a tus hijos?”, I was hyperactive, “¿Dejas que tu mujer te controle?”, whenever my mother would try to defend herself. My father was not aware that his actions were holding us to such low standards and feeding our insecurities. He did not realize that self-love only occurs when values, perspectives and opinions are welcomed and respected without criticism, instead with consideration and love. He confused pride with arrogance, “No me importa lo que piensas, solo haz lo que yo digo”. He chose the path of the tyrant and ruled by inflicting fear. He was successful to a point, but the consequences resulted with an insecure son, rebellious and non-committal daughter, and a fearful and insecure wife. He did not realize that his fight to maintain power and control was destroying his family’s self-esteem, self-respect and self-love. HE CONFUSED THE DUTIES OF A LOVING FATHER WITH THE DUTIES OF A TYRANT PROVIDER! Sadly, because it’s not reasonable to be drunk every day to feel comfortable enough to show affection and compassion, the only other time I realized that my father loved us was when he almost passed away due to pneumonia – I never saw a Latino man weep more than my father the day when he faced death. Unfortunately, that event was not enough to convince him to choose to shift his character, but it was enough for me to see that his actions were not related to his lack of love for us and I decided to “understand” him and to discontinue any type of relationship and communication with him to avoid any Latino male “machista” confrontations. My sister quickly joined me on the disconnection, since she agreed that his attitude needed serious shifting, and my mother was starting to take her stand and demanded respect. For years, my father lived an incarcerated life of solitude, lucky enough to have his wife’s love and acceptance keeping him alive. 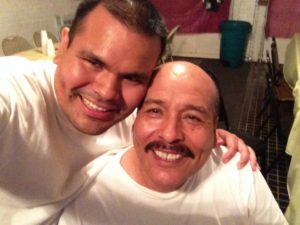 It took a new Latino mentality to mend the broken relationship with my father. Vulnerability is what I expressed to accept the possible rejection of forgiveness from my father and I exercised courageousness while going against my own pride and ego to reunite with my hero. “If it was to be, it was up to me”, is what I believed and practiced to inspire shift. “If it is to be, it is up to me”, is what freed the warrior from solidarity. There is something you need to know… It still is the hardest decision I have ever made and the most rewarding of my life. Today I mess with him and hug him and even miss him (believe me, it was not like that before). My father is still who he is and still has a temper, but he gets over it because he knows that our love is more valuable than being lonely and I’m just a bigger person to love him for who he is. That “challenge” that I faced by being vulnerable to the possibility of being rejected while forgiving him was well worth the sacrifice. I think of it this way: it’s over a year of life that I got to spend with him on loving terms and that I got to enjoy the teddy bear that he is once relieved of his loneliness and resentment. And the dividends will keep paying for as long as he is alive. But what gives me the most relief is the fact that I will never REGRET not having forgiven him and wishing that I had spent more time with him while he was still alive…. That type of pain and regret eats up your soul and it’s JUST NOT WORTH IT. Yes, there’s still a chance that the results will not be favorable, but the chance of a favorable result is well worth the sacrifice. So let’s make pretend that it is just you and I right now. What I would do is look you DIRECTLY into your eyes and with a stern voice, full of love, compassion and understanding, I would tell you: “All that anger, resentment, pain and ego that you are feeling right now is not worth it. Even if he/she does not accept your apology, all that negative energy that you are feeling right now is killing you slowly and is probably afecting any current romantic relationships or is causing you to lack trust. From experience and from the bottom of my heart I ask you, LET IT GO and FORGIVE. La vida es muy corta como para vivir con arrepentimientos (Life is too short to live with regret). Dennis Sanchez, “The Latino Sales Advisor,” is the founder of Marcar Visions Marketing, an agency in NYC/NJ that advises Latino small business owners on SALES and marketing solutions. 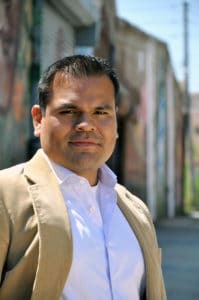 He’s also the founder of “Los Compadres, Modern Caballelos,” a non-profit organization that promotes personal and leadership development among Latino males. If you wish to connect and engage with the Latinos in NYC & NJ, request a free consultation with Dennis HERE. This entry was posted in For Mothers & Tias, Ideas, Los Dads, Los Influencers, Mind, Personal, Soul and tagged dads, Dennis Sanchez, Father's Day, fathers, forgiveness. Bookmark the permalink. That was a good read. Reading anything that deals with family is especially important to me. It lets me note some of the actions that I am taking on my two children and wife. Thanks again for the article.